The Main Hall of the Kalos Pokémon League. Kalos Pokémon League (カロスポケモンリーグ, Kalos Pokémon League) is a stage in Super Smash Bros. for Wii U and Super Smash Bros. Ultimate. The stage is set in the Pokémon League of the Kalos region from Pokémon X and Y. Greninja is fought here in its unlocking battle in Ultimate. The Main Hall of the Kalos Pokémon League in Super Smash Bros. for Wii U. 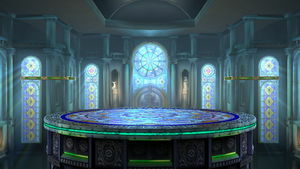 The stage features the four chambers of the Kalos Pokémon League: the Blazing Chamber, Dragonmark Chamber, Ironworks Chamber, and Flood Chamber, as well as the Main Hall. Similarly to both Pokémon Stadium stages, the stage transitions into each chamber in random order, reverting back to the Main Hall between each one, and continuing the cycle when it is complete with another random order. Every variation features a main body with two platforms of some kind, which descend from above at the start of each chamber and ascend when the stage is about to transition; the platforms ascend past the upper blast line, KOing any character still on them. Each chamber has its own set of stage hazards, as well as a set of Pokémon matching the chamber's type that appear in the background. There is a 20% chance each time a chamber is visited that instead of the usual background Pokémon, a specific Legendary Pokémon will appear, adding to or replacing the chamber's usual hazards. In the Dragonmark Chamber, Dragon-type Pokémon Garchomp, Hydreigon, Axew, and Dragonite appear. At regular intervals, three times in the course of the transformation, the giant dragon statue in the far background roars, causing damaging purple flames to erupt from the floor. Each blast does 15% with decent knockback. The Chamber's Legendary Pokémon is Rayquaza: occasionally, a trail of electricity crosses the screen, a warning that Rayquaza is about to travel in its path. Its attack is similar to its dashing during its Subspace Emissary battle in Brawl. If Rayquaza is present, the dragon statue remains still and no bursts occur. The Dragonmark Chamber, with a flame burst at its center. Rayquaza in the Dragonmark Chamber. In the Blazing Chamber, Fire-types Infernape, Tepig, Blaziken, and Male Pyroar appear. The two platforms are supported by pillars of fire, which sear whoever touches them dealing 4% damage per hit. Two flaming spouts also appear at the sides of the stage. The Chamber's Legendary Pokémon is Ho-Oh: when it shows up, the flames in the stage flare up and raise the platforms and the lateral bursts have increased intensity. In the Ironworks Chamber, Steel-types Klinklang, Steelix, Scizor, and Honedge appear. When the stage transitions into this room, a pair of huge swords plunge into the stage, damaging anyone on contact; their cross-guards serving as platforms. Touching their blades at any time deals 4% damage with minor knockback (metal fighters do not flinch from this); however it is possible to get juggled between them when they rise back up at the end of the transition. 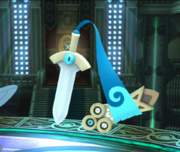 Attacking the swords also makes them sink further into the stage. Every 5 to 8 seconds, a puddle of metallic liquid appears in the center of the stage; any fighters who touch the pool will become metallic for a short while. The Chamber's Legendary Pokémon is Registeel: it attacks once by shaking the ground, causing the sword platforms to leap out and spin before falling back into place, damaging fighters. Fighters on the ground during its attack will be buried into the stage. If Registeel is present, the metal pool doesn't appear. The Ironworks Chamber, with the metal pool at its center. The right sword has been plunged into the ground by attacks. Registeel's attack. Note how Ganondorf has been buried. In the Flood Chamber, Water-types Piplup, Wailord, Blastoise, and Clawitzer appear. When the stage transitions into this room, two ramps appear from the sides, connecting the main body of the stage to the side blast zones. Periodically, a strong stream of water crosses the entire stage, carrying away any players caught into it: if they don't react they are likely to be flushed beyond the lateral blast zone. Buried and frozen characters will not be carried away with the current. The Chamber's Legendary Pokémon is Manaphy: it turns the main platform into a sink, whose strong current can carry characters down to the lower blast line. If Manaphy is present, no stream appears. Manaphy's whirlpool at the center of the stage. 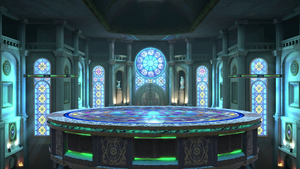 In Super Smash Bros. for Wii U, the Ω form of the stage is situated at the Main Hall, without the floating platforms. In 8-Player Smash, the lighting is darker than usual. Before version 1.1.3, wall jumping was oddly not possible on the Ω form of Kalos Pokémon League, but was on the normal version. In Super Smash Bros. Ultimate, the Ω form and Battlefield form are similar to the normal form and takes place in the default Main Hall; however, the main platform does not extend below the blast line and is resized and reshaped to match Final Destination and Battlefield, respectively. The three soft platforms of the Battlefield form are based on the two soft platforms in the normal form. The main hall of the Kalos Pokémon League as it originally appeared in Pokémon X and Y. In Pokémon X and Y, the Pokémon League is a large building located at the end of Victory Road in the Kalos Region, which can only be accessed by the player after they accumulated all eight Gym Badges. The inside of the League is split into six rooms, a main lobby and a Chamber for each of the Elite Four and the Champion, where challengers can face Diantha, the Champion; the latter does not appear in Smash's incarnation. 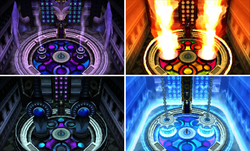 The four chambers of the Kalos Pokémon League as they originally appeared in Pokémon X and Y. 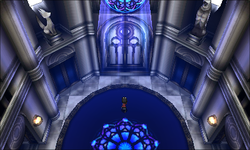 The second chamber is called the Dragonmark Chamber and contains Drasna, a Dragon-type specialist from Sinnoh. During her introduction, a large dragon statue in the Chamber's background spreads its wings and raises its head, after which purple flames erupt from the burners in the room. The fourth chamber is the Blazing Chamber, which houses Malva, a Fire-type specialist who also works for Team Flare. Pyroar is one of her Pokémon (although it is female, while the one on this stage is male). During her introduction, two huge pillars of fire erupt from the ground. The first of the chambers is called the Ironworks Chamber, which houses Wikstrom, a Steel-type specialist dressed as a knight. Scizor and Aegislash, Honedge's final evolution, are among his Pokémon. During his introduction, a large pair of swords falls from the ceiling and plunges into the ground. The third chamber is called the Flood Chamber, which houses Siebold, a Water-type specialist who takes great pride in battling and the culinary arts. Clawitzer is one of his Pokémon. During his introduction, a couple of locks open and flood the Chamber with water. Due to the large number of highly intrusive stage hazards (particularly those of the Ironworks and Flood Chambers), this stage is universally banned in tournament play. However, in Ultimate, the stage can be considered a counterpick if Hazards are turned off. Charizard and Greninja fighting in the Main Hall. Robin in the Dragonmark Chamber. Robin and Marth in the Blazing Chamber. Meta Knight and Kirby in the Dragonmark Chamber, with Garchomp, Hydreigon, Axew, and Dragonite in the background. Wailord still in the background when the stage is transitioning. The platforms of the stage constantly cross the upper blast line. This is as far up as a player can go without being KO'd. Corrin and Little Mac fighting on the stage. Greninja on the stage in Ultimate. Ness after performing his up smash on the stage. Pit after using Palutena Bow on the stage. Sheik near the flames of the Blazing Chamber on the stage. Snake using his neutral attack on Little Mac on the stage. Honedge in the Ironworks Chamber (notice the scabbard). Registeel is the only Legendary Pokémon to appear on this stage that has not appeared in previous games in any way, with Rayquaza being a boss in The Subspace Emissary and Ho-Oh and Manaphy previously being Poké Ball Pokémon. The Dragonmark Chamber is the only chamber to not feature any Pokémon that belonged to its respective Elite Four member in the games. All the Pokémon in the background of the Dragonmark Chamber are part of evolutionary families used by at least one Champion in the Pokémon series. If Jigglypuff is Star KO'd when the stage transitions, its eyes will disappear. It can be seen here. Honedge's body is still visible through its scabbard even though it's not wearing it. It's possible to see its eye and parts of the blade through what should be holes. This error was fixed in Super Smash Bros. Ultimate. All of the Fire-type Pokémon that normally appear in the Blazing Chamber excluding Pyroar are Starter Pokémon that are Fire/Fighting-types (while Tepig is a pure Fire-type, its evolutions are Fire/Fighting-type). A two-player match in Ultimate will have one fighter start closer to the center of the stage than the other. Due to Scizor being in the stage's background, despite having Scizor return as a Pokeball Pokémon in Ultimate, after being absent since Melee, Scizor cannot be summoned here. This page was last edited on April 16, 2019, at 05:32.